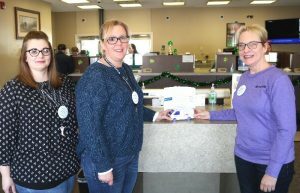 FULTON, NY – Representatives from Oswego County Opportunities Nutrition Services deliver a March for Meals paper van donation box to the Mexico branch of Pathfinder Bank. From left are Mexico Activity and Dining Center Manager Brandy Simonton, Allison Griffin and assistant branch manager Robin Dettbarn. As part of its campaign to raise awareness of its Nutrition Services, OCO has placed paper van donation boxes at businesses throughout Oswego County. All donations will be used to support OCO’s Meals On Wheels program and its six dining and activity centers. For information on OCO Nutrition Services and its programs visit the OCO Nutrition Services page on Facebook or log on to www.oco.org. OCO Nutrition Services programs are partially supported through grants from OCO partners: Oswego County Office for the Aging; New York State Office for the Aging; and the United Way of Greater Oswego, Inc.